All image processing functions provided operate on types that implement the GenericImage trait and return an ImageBuf. ///The width and height of this image. ///The bounding rectangle of this image. ///Return an Iterator over the pixels of this image. An image parametarised by its Pixel types, represented by a width and height and a vector of pixels. It provides direct access to its pixels and implements the GenericImage trait. //Construct a new ImageBuf with the specified width and height. //Construct a new by repeated calls to the supplied closure. A DynamicImage is an enumeration over all supported ImageBuf<P> types. Its exact image type is determined at runtime. It is the type returned when opening an image. For convenience DynamicImage's reimplement all image processing functions. //Use the open function to load an image from a PAth. //```open``` returns a dynamic image. //Write the contents of this image to the Writer in PNG format. 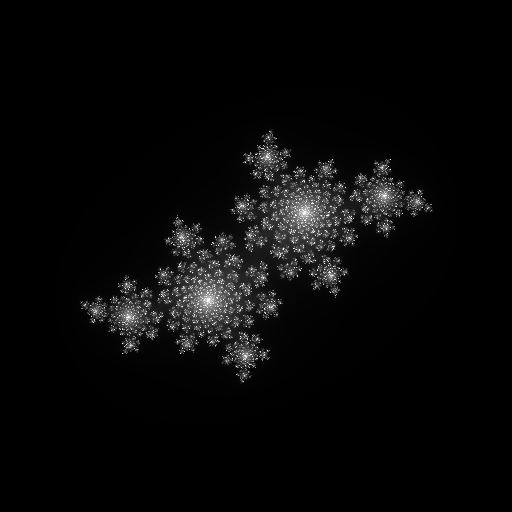 //!An example of generating julia fractals. // The GenericImage trait provides the method put_pixel. // Save the image as "fractal.png"
//We must indicate the image's color type and what format to save as.